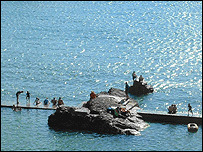 A list of works has been decided on to re-open a unique tidal sea pool in Cornwall before the summer. North Cornwall District Council closed the 70-year-old structure at Bude's Summerleaze Beach just before Easter because of health and safety issues. Now a total £100,000 is to be invested in the facility. Before it can open, a bigger sloping area for children and non-swimmers has to be created, along with new access steps and a wider walkway. New sluice gates also need to be installed as part of the work. One of the biggest concerns had centred around how to stop accidents when the pool was closed. North Cornwall Council said it would will review all the signage to make the warnings clearer and put up a small section of railings. When the council closed the pool on the advice from the Health and Safety Executive, thousands of local people signed a petition to have it re-opened. Many people said the popular resort would suffer economically if the pool remained closed during the summer months.